The difference between a funny movie and a truly great comedy is subjective. So, when it comes to writing a successful comedy, many writers want to appeal to the lowest common denominator. While many screenwriters want to please all, humor isn’t universal. What makes a baby cackle in Albuquerque won’t cut the mustard in Ouagadougou! Today, let’s explore three ways writers and filmmakers use situation, dialogue, and performance to enhance the ordinary and upend the familiar for gut-busting belly laughs. So, writers and filmmakers: Dig into our list of the best comedy movies of all time. While the British appreciate a dry, wry wit, Americans love slapstick. Again, what is funny is something that is truly subjective. So, as a screenwriter, one must find ways to hedge the bets on how to write for laughs. There are certain comedies that will stand the test of time. It is usually one of three reasons why these comedies can be revisited again and again and the laughs never seem to stop. Often, the situation is the reason that comedy is successful even on repeat viewing. Harold Lloyd in Safety Last made audiences laugh in 1923 as much as it does today. Consider an over-the-top performance such as Robin Williams in Mrs. Doubtfire. Compare that to Rowan Atkinson as the most subtle Mr. Bean. Variation in performance is a surefire way to make sure the words a writer has committed to page come to life. Finally, dialogue, or the lack thereof, is like a roadmap for comedic timing, a compass for performance and a barometer that carefully calibrates the situation. Comedy is all about timing. And so top comedy movies embrace their moment. What’s funny right now might not have registered as a blip 20 years ago. Staging, camera angles, editing, themes, emotions — today’s most hilarious movies come together like lightning in a bottle, all in the context of the surrounding world. They’re signs of the times. Here are the best new comedy movies. Consider their pacing, boldness, and honesty. They strike a chord, and tickle your funny bone, because they’re fresh and “in the moment,” and also because they’re relatable and offer timeless laughs. What constitutes a “recent” funny movie? Five years? Five months? Nah. Like comedy, you have to feel it out. This makes our list of the best new comedies because it’s hysterical, creepy, violent, often unbelievable, and jam-packed with memorable morons. Just like the times in which we’re living! Game Night tells the story of a group of friends whose murder-mystery party game takes a frightening turn. Notice how readily horror and thriller filmmaking techniques — the slow drip of a drop of blood, obscuring through lighting, the blocking in a pistol standoff scene — lend themselves to hilarity. The story unfolds over the course of one twisted night, so it’s compact and easy to wrap your head around. Perfect for modern audiences. 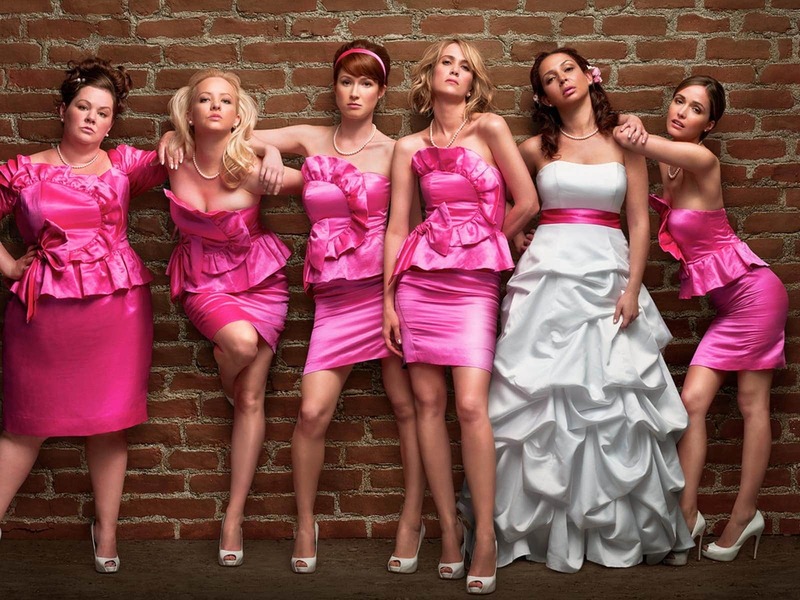 Dispelling the notion that women aren’t funny, once and for all, Bridesmaids may be the funniest comedy film of the 21st Century. This film takes the familiar situation of pre-wedding bridal partying and makes us laugh for two straight hours. This is one of the best new comedy movies because, quite simply, it’s a recent classic. Writer and leading player Kristen Wiig hits a home run in her debut starring role as the best friend of the bride to be. The always reliable Maya Rudolph is pitch perfect. But the breakout stars of the movie, almost literally, are Melissa McCarthy and Rose Byrne. McCarthy does with a few simple scenes what stars do best, she steals them. Rose Byrne doesn’t deliver one joke, but her sophistication and beauty are the perfect foil for the rest of the cast. Potty humor is the lowest common denominator in comedy, but here it is gut-bustingly funny. Director Paul Feig definitely knows how to get a performance from McCarthy. The two teamed up twice more in The Heat and Spy. Ellie Kemper gives a hint of her Unbreakable Kimmy Schmidt character here. Some of the best new comedies come from older non-comedies. What was once gritty and dramatic is now fodder for the hilarious movies of today. 21 Jump Street: Potential disaster? Absolutely. Surprising masterpiece? Yup. How do you update material, own it, make it timely, and turn it into one of the best recent comedy movies? Do what directors Phil Lord and Christopher Miller did with 21 Jump Street. Interpreting the world we’re in includes an element of distilling and digesting the recent past so it makes sense for today’s viewers. In a way, 21 Jump Street draws from a 1980s teen-based crime procedural television show to comment on our modern world. How? By taking it seriously, but not too seriously. By having fun with it, even though the stakes might be very real. With Ice Cube in peak form, a pre-Oscar Brie Larson owning her role, and two charismatic superstar leads in Channing Tatum and Jonah Hill, it’s no wonder the film spawned a sequel, 22 Jump Street. If you want to make an action comedy like 21 Jump Street, you’d better learn how to write and shoot action scenes like a real-deal action director. And then, of course, loosen up and make it funny. One theme in identifying the best new comedies? They sneak up on you. We’ve seen it all. We know too much about the world we’re living in. And then a movie like Popstar slaps you across the face. The movie offers filmmakers a crash course in how to shoot a music video that’s truly funny. And, maybe more than any of the other best new comedies on our list, Popstar also boasts an expanding cult following. Here are our top classic comedy movies of all time. We’ve chosen these as the best classic comedies because they get it all just right to keep the laughs coming. Situation, performance, and dialogue all come together. The comedy hits the bullseye, over and over again, in these comedy classics. The late, great Gene Wilder would have been on this list with any number of the best comedy movies of all time. He gifted the world a treasure trove of comedy as a writer, director, and performer. But, it’s the Mel Brooks-directed Young Frankenstein that’s on this list for a combination of situation, performance, and dialogue. This comedy tickles our fancy as one of the best classic comedy movies. The fact that this one is black and white, almost fifty years old, and still making us guffaw is a testament to the script that Mel Brooks and Gene Wilder wrote. The performances alternate between deadpan and melodramatic. A true testament to Mr. Brooks, who did it on screen and in the theater. 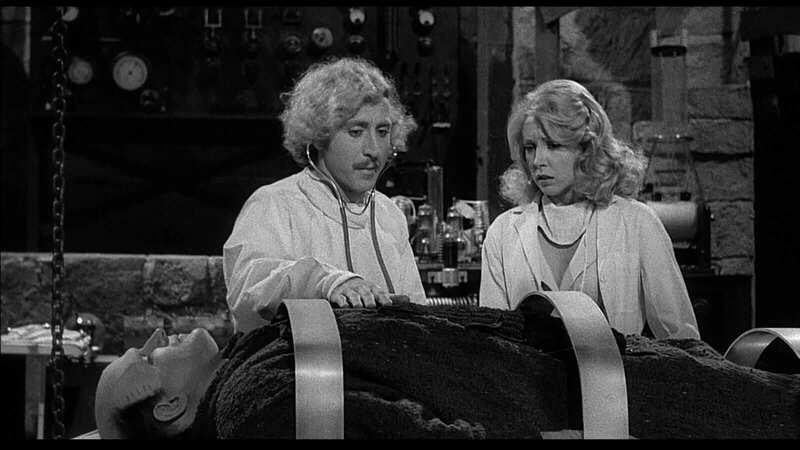 Young Frankenstein is black and white, so obviously it’s one of the best classic comedies, right? The situation in this comedy is one that is perfect for satire. Making light of Mary Shelley’s 100 year-old monster tale seems like a no-brainer because of this film. The dialogue is quick and clever and never forces the laugh. Dr. Frankenstein: Are you saying that I put an abnormal brain into a seven and a half foot long, fifty-four-inch wide GORILLA?!! IS THAT WHAT YOU'RE TELLING ME!!?!? If you are only permitted to see one Mel Brooks or Gene Wilder film, Young Frankenstein is the film to see. Not only is this one of the best comedies of all time, it is also one of the most quoted. A simple logline almost belittles this uproariously funny film. The situation is one that is usually so stress-inducing that no one in the real world would ever find it humorous. But David Zucker and Writer-director Jim Abrahams mine this one for comedy gold. All the actors give performances of sincerity, which makes this the best comedy movie that shows how consistent performances are the key to laughs. The pacing of the dialogue ensures you’re never bored on this flight. Writer David Zucker would go on to even greater success with Leslie Nielsen in The Naked Gun series, where he again perfected the combination of situation, dialogue, and performance. 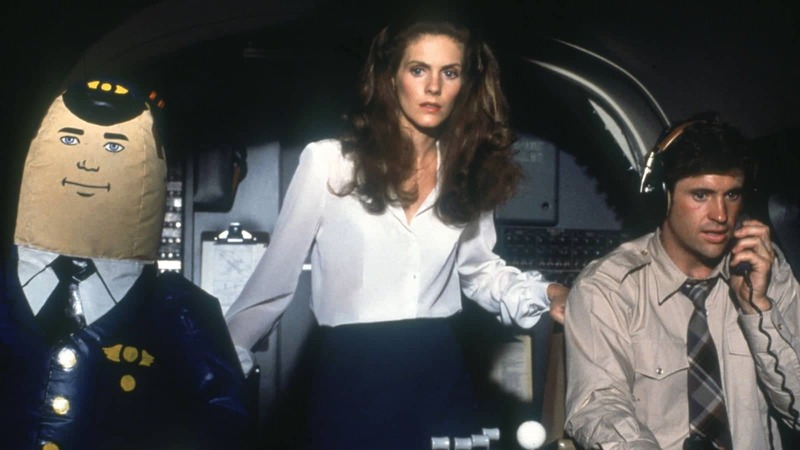 Originally taking shape as something of a spoof of 1970s disaster films like The Towering Inferno, Earthquake, and of course Airport and its sequels, Airplane has outlived the source material it aims to parody. In our book, that makes it one of the best classic comedy movies. No list of the best classic comedy movies would be complete without at least one performance from the late, great Robin Williams. 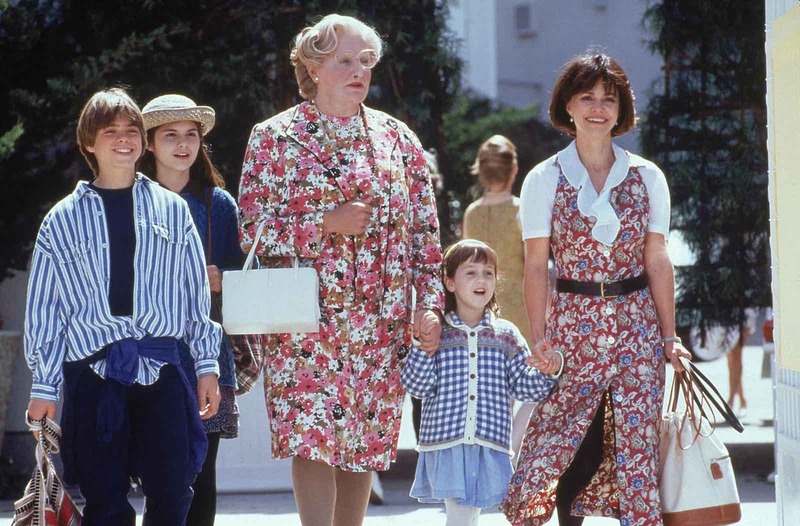 There are any number of performances that he gave that should be here, but his most shining and arguably most memorable has to be the 1993 hit comedy, Mrs. Doubtfire. The premise is simple, and borders on the ridiculous. After a divorce, a man disguises himself as an aging nanny so he can spend time with his kids. The script would be one-note if the orchestra of talent that was Robin Williams was not on full display. Ever since Some Like It Hot, hilarious movies have featured men dressing up as women. Here’s another of the best comedy movies of all time to feature a cross-dressing lead. 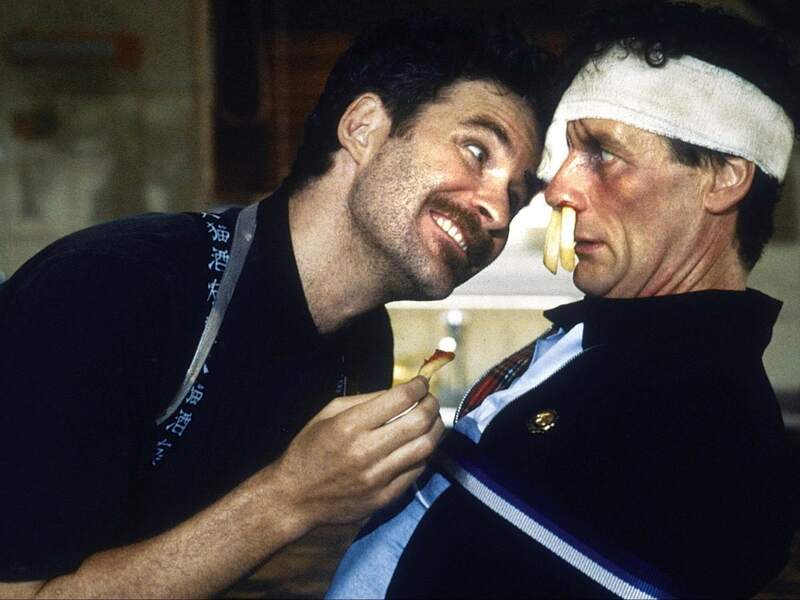 One of the few comedic performances to win an Oscar for Best Actor (Kevin Kline), A Fish Called Wanda is a perfect comedy. John Cleese and Michael Palin, notorious from Monty Python, are carefully matched with Kline’s “don’t call me stupid” Otto, a dim-witted conman. Jamie Lee Curtis plays it straight while the men around her give scenery-chewing performances that define comedy chops. The story involves four characters coming together to commit an armed robbery. Simple? Yes. Funny? Without a doubt. Just look at the expressions on the actors’ faces in this clip, below. It comes from good comedy directing, and also from knowing how to cast a film with the right talent. Is A Fish Called Wanda one of the best English comedy movies, or is it one of the best American comedies? Well, it’s kind of both. But it’s definitely one of the top classic comedy movies of all time, which is why it’s in this section of our article, with the rest of the classics. Christopher Guest is a comedy genius. There we said it. After you’ve seen this satirical look at community theater you will say the same thing. He is the man who brought you Spinal Tap!, Best In Show and For Your Consideration. Waiting For Guffman is almost a placeholder on the list of the top comedy movies of all time. It represents Christopher Guest. Classic comedy movies owe him a great debt. Guest uses his usual cast of kooky players in Parker Posey, Eugene Levy, Catherine O’Hara, and Fred Willard. Their performances aren’t so dead-on — it seems as though they are making up the dialogue as they go along. A humorous take on Waiting For Godot, the satire more than borders on farce, it drips with every line. The amateur cast of a small-town musical production goes overboard when they learn that a Broadway star will attend a performance. Anxiety, eagerness, friendships, and rivalries boil to the surface in the characters' hilarious preparations. Does the big shot Broadway star every show up? Don't worry, no spoilers here. Steve Martin deserves a place here. Don’t take our word for it. 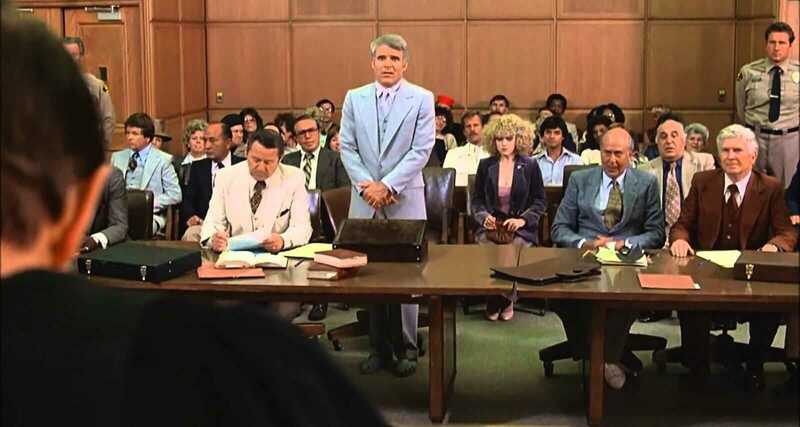 If you can’t make time to see his virtuoso performance in Roxanne, or LA Story or Planes, Trains, and Automobiles or Bowfinger, or Three Amigos … definitely see The Jerk. Steve Martin is so versatile he plays African American decades before Robert Downey Jr. would receive an Oscar nomination for doing, some say, a lesser job. This article is about the best comedy movies of all time. And, truth be told, many of the films on this list are American comedy movies. In this section, we highlight the best comedy movies that … well, really feel American. These are the best American comedies that embrace (and upend) American themes, American locations, American values, and American history. It seems appropriate to start our list of American comedy movies by proudly flying the American flag. It is a rare comedy that can wrangle belly laughs and ten Oscar nominations, but Tootsie did just that. Critical acclaim and the number two box office hit movie of 1982? 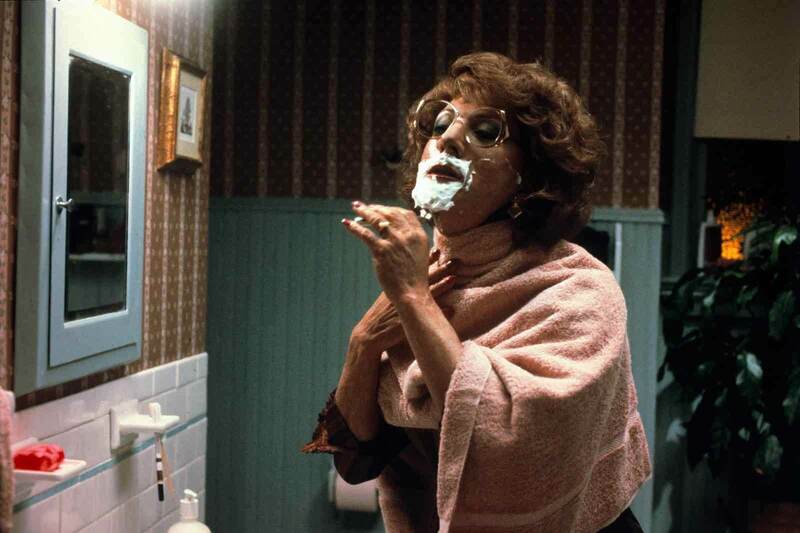 Tootsie deserves to be on any list of the best comedy movies of all time. An out-of-work actor dresses as a woman to get a job and unwittingly becomes a symbol of female empowerment. In terms of performances, the three Oscar nominations for performances that this movie received, out of a total of ten, was well deserved. Dustin Hoffman doesn’t play for the laughs even once, and it doesn’t matter. This film is truly one of the best comedies ever made. Bill Murray shows why he is a national treasure in this classic. Ivan Reitman directed this top comedy in 1984. It spawned two sequels, an animated sequel, and a number one soundtrack. The situation is otherworldly, to say the least. The performances couldn’t have been better orchestrated, ranging from Sigourney Weaver’s calm and measured elegance to Rick Moranis’ zany and mad-capped deliveries. And guess who’s back on the list? Bill Murray is never really the Ghostbusters straight man — that’s what Harold Ramis is for — but in this classic of American comedy movies, The Murricane shines as the complex Dr. Peter Venkman. Dr. Peter Venkman: Human sacrifice, dogs and cats living together ... mass hysteria! He calls the bluff of the premise of the movie and makes the situation believable without even trying. He makes it look easy, but it's not. That's why he's Bill Murray. If you haven’t seen this top comedy movie of 1988, stop what you are doing and find it. The movie stars Eddie Murphy and Eddie Murphy and Eddie Murphy in what was to be the first of his multiple character performance comedy films. The premise, an African Prince comes to the United States to find a princess and ends up … Wait for it … In Queens. Not only does Eddie Murphy cross the demographics of socio-economics in America, but he also makes us laugh at every social class. Eddie Murphy re-teams with Trading Places director John Landis on this film and would again for the decidedly less funny Beverly Hills Cop III. Eddie Murphy has made his fair share of hilarious movies. This one belongs right here. For more Eddie, read on. This is the comedy that made Eddie Murphy a box office draw, but it is one of the best comedies of all times thanks to the performances of all three leads. The situation is a classic fish out of water. Take a poor, uneducated criminal and WASPy, Harvard-educated trust fund baby and flip the script. The dialogue is functional, with everyone except Eddie Murphy playing the straight men … and woman. In the hands of lesser actors and director, the humor wouldn’t sound so loudly. A particularly inspired Don Ameche and Ralph Bellamy, as the scheming tycoons whose wager causes the trade, are performances that will live on. Mel Brooks and Gene Wilder, previously represented in this article’s section on the best classic comedy movies, return to the list in full force with an American comedy classic. The Western film, known worldwide as a pillar of American frontier spirit and adventure, gets its comeuppance in this satirical take. Bart: What are your pleasures? What do you like to do? Waco Kid: Oh, I don’t know … Play chess. Screw. Bart: Well let’s play chess. The film’s comedy feels so “American” because it deftly pokes fun at the great American paradox: diversity and multiculturalism go hand-in-hand with racism and political incorrectness. It’s offensive. It’s hypocritical. It’s uncomfortable. And that’s the whole point, because it’s also hilarious. The film remains a hodgepodge of hot-button, misfire-and-it’s-a-disaster issues, but it pulls it off. Could it be made today? Who knows. But to this day, Mel Brooks insists Blazing Saddles is the funniest movie he’s ever made. Madeline Kahn received a Best Supporting Actress nomination for an Academy Award after her performance as Lili von Shtupp in Blazing Saddles. And speaking of American comedy movies with Oscar noms, read on. 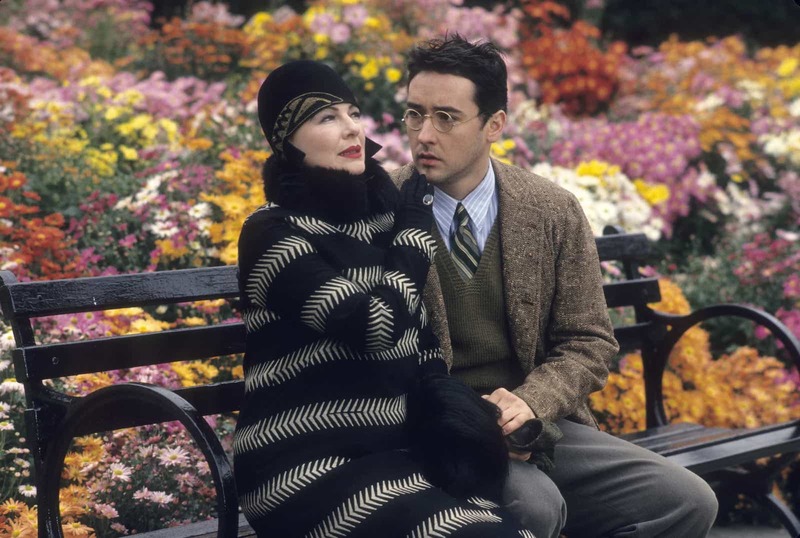 Woody Allen doesn’t get much love in the line up of best comedy films because of his personal life. But, one of his films that should get more respect is Bullets Over Broadway. The Oscar-winning, all-star cast manages to keep a straight face while delivering some of the most clever lines and downright hysterical performances committed to film. From the best line in the movie, “Don’t speak!” to the more obvious, “You better get in the mood cause he’s paying the rent.” This flick keeps them coming fast and easy. In addition to receiving Best Supporting Actress Oscar for Dianne Wiest, it also received Oscar nominations for Best Actor in a Supporting Role for Chazz Palminteri, Best Supporting Actress for Jennifer Tilly, Best Director and Best Screenplay Written Directly for the Screen for Woody Allen. When the mob comes to Broadway, the laughs don’t stop until the final bow. We’re also including Woody Allen on our list because the man makes films. Like, a lot of films. He uses different techniques and his own directing style to create a vast body of work. It has drama, it has romance, it’s a coming-of-age film, and it’s also one of the best comedy movies of all time. This touching tale of a teenage pregnancy serves as Diablo Cody’s screenwriting debut, as well as the second feature by director Jason Reitman (who previously cut his teeth directing the very funny Thank You For Smoking, with a pitch-perfect performance by Rob Lowe). Reitman has said that he aims for “tonal consistency” as a director. Dangerous situations, tension, discomfort, conflict — the key is to approach it all as naturalistically as possible. To make it real. That’s where humor comes in. When life-changing drama unfolds in real life, people often incorporate to humor to make it palatable. To make life livable. Same goes for life-changing drama in film, as Reitman hits upon with his directing style. 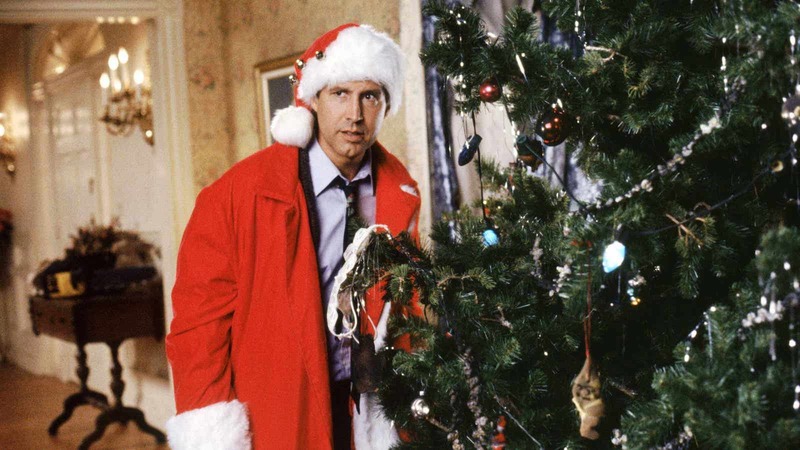 One of the all-time great Christmas movies and one of the funniest movies ever made. Yup, that is Oscar nominee Juliette Lewis and Big Bang Theory’s Jonathan Galecki in supporting roles. Like our list of the best comedy movies of all time? Keep reading. A lot of the best English-language comedy movies of all time come from the birthplace of the English language: England. Here, we’ll look the best English comedy movies that every writer and director needs to know. Situation, performance, and dialogue all come together in just the right manner for the comedy to hit the bullseye, over and over again. If we had a nickel for every time this pic popped up on the 100 funniest movies of all time lists, we’d have … a lot of British pounds. John Cleese and company made themselves international stars with this one. As the comedy troupe’s first feature-length motion picture, co-directors Terry Jones and Terry Gilliam — Monty Python’s “Two Terrys” — got a crash-course in directing a scripted film. The bulk of the troupe’s prior televised bits (Monty Python’s Flying Circus) and sketch films (And Now for Something Completely Different …) relied heavily on ad-libs and improv. Sort of a proto-Judd Apatow approach that paved the way for comedy directors to come. 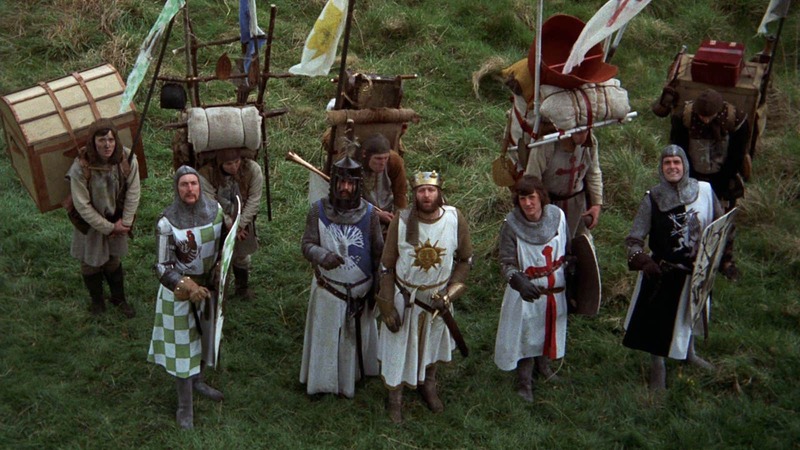 But with Monty Python and the Holy Grail, the team proved that they could make a well-rehearsed, carefully orchestrated cinematic comedy — and make one of the best comedy movies of all time in the process. This comedy classic zeroes in on zombies and uses a tried-and-true horror premise to shine a light on the modern human condition. The result is one of the most hilarious movies of the 2000s. Undoubtedly more funny than scary, Shaun of the Dead is beloved by critics and fans. A zombie apocalypse serves as the backdrop for a regular bloke trying to sort out his life and make something of himself. The filmmakers don’t shy away from gore and scares, but they still keep it bright and chipper to set the perfect mood: Just the right blend of cackles and carnage. The full title of this outrageous comedy is Borat: Cultural Learnings of America for Make Benefit Glorious Nation of Kazakhstan. That’s tough to remember, and this standout on our list of English comedy movies is also tough to categorize. Is it a mockumentary? A glorified prank show? A legitimate travel documentary? A straight-up scripted comedy in disguise? Stylistically, it is what it is. And what is it, exactly? One of the top comedy movies you’ll ever see, that’s what. English comedy chameleon Sacha Baron Cohen disappears into the role of Borat. Ken Davitian portrays Borat’s sidekick, Azamat Bagatov. The result is alternately offensive, uncomfortable, slapsticky, and pure genius. The film takes documentary filmmaking techniques and warps them, just as it takes the boundaries of good taste and decorum and shatters them to pieces. But make no mistake: For film buffs and comedy aficionados alike, this twisted-yet-charming romp through the English countryside is required viewing. If John Cassavetes was English, and absolutely hilarious, Withnail and I is the kind of movie he’d make. Screenwriter-director Bruce Robinson manages to present raw, honest characters in a polished, well-refined English way. This results in inspiring simplicity and impactful artistry throughout Withnail and I. Funny English movies push limits and boundaries, often in subtle but powerful English ways. The comedy here comes across as both mannered and unhinged, respectable and debaucherous. Trust us, it all goes down smoother than a pint of Boddingtons Ale. An enigma, a paradox, a very “English” style — and another must-watch on our list of the best comedy movies of all time. Romantic Comedies, or RomComs, are a staple of the comedy world and the only way most action-oriented men can digest the “chick flick”. But the funniest romantic comedies are those genre-defying love tales that inspire tears of laughter. Here are the best romantic comedies that use dialogue, performances, and situations like the very best. One of the best and funniest Christmas-themed romantic comedy movies to come along in the 2000s also has a dream cast of British talent. The lives of eight couples intertwine in various states of love a month before Christmas in London. Emma Thompson, the late Alan Rickman, Bill Nighy, Liam Neeson, Laura Linney, Colin Firth, and Hugh Grant. Hugh Grant is known for a few romantic comedies like Notting Hill, Four Weddings and a Funeral and Bridget Jones’ Diary and in Love, Actually, Hugh knows how to butter his biscuits. He pulls no surprises, just all bumbling English charm. But, there are several love stories that happen in this gem from across the pond. A pre-fame Martin Freeman stands out. But a lovely Keira Knightly, with Andrew Lincoln and Chiwetel Ejiofor, all hold their own. Also, an intentional non-comedic cameo by Billy Bob Thornton adds some gravitas to the film. "Girls love musicians, don't they? Even the really weird ones get girlfriends." Do we need to mention that Mr. Bean himself, Rowan Atkinson, makes a hysterical cameo as well? The funny and poignant soundtrack is also exceptional. This film belongs on any list of great romantic comedies. 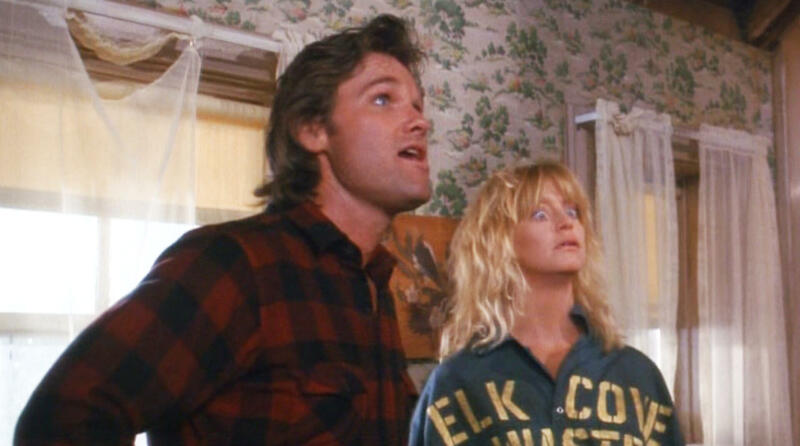 Before she was a Hollywood legend, Goldie Hawn starred in some of the top comedies of all time. Butterflies are Free, Private Benjamin, Protocol, Wildcats and Seems Like Old Times were major hits over three decades. The fact that she produced some of them and received two Oscar nominations, and one win, means that this funny lady takes comedy very seriously. For our list today, the 1987 film Overboard is a great example of situation, performance, and dialogue coming together for a huge dose of humor. The chemistry of the stars really make this one of the best romantic comedies. The situation here is another fish out of water story. An heiress falls overboard her yacht and gets amnesia. The handyman she cheated comes to claim her as his wife. Kurt Russell is the straight man as Hawn wipes the floor with everyone in her path. How she convincingly portrays a cold-hearted heiress and then a long-suffering, impoverished housewife, is the reason her career has lasted more than forty years. The dialogue isn’t complicated, it’s simply funny. Cameos by Katherine Helmond and Roddy McDowell makes us wish for a sequel or prequel — although there was a pretty decent remake in 2018 with Anna Faris and Eugenio Derbez. One of the best romantic comedies of all time, 50 First Dates was a huge hit for Adam Sandler and Drew Barrymore. In the high-concept premise, a man falls for a woman with short-term memory loss. Every day, he has to try to make her fall in love with him all over again. This excellent time loop setup builds upon the classic comedy Groundhog Day and the stars of the film are at their very best. Instead of a true time warp, however, Barrymore's character suffers from a fictional "Goldfield Syndrome," which resets her memory on a daily basis. Sandler, who honed his comedic chops on the long-running Saturday Night Live is at his best playing the foil to Drew Barrymore’s amnesiac love interest. Barrymore, born a Hollywood star, proves that she earns a place in the category of best romantic comedies. Starting their collaboration with The Wedding Singer, Barrymore and Sandler would do another film with much less comedic magic, Blended. FYI, the situation and performances make up for simply adequate dialogue. It’s difficult to remember a time when Julia Robert’s wasn’t the reigning queen of romantic comedy. While Pretty Woman is pretty dated in subject matter and plot, My Best Friend’s Wedding holds up today. Love is eternal, and so are its many mix-ups and antics. In this story, a woman in love with her best friend tries to ruin his marriage before it even starts. P.J. Hogan of Muriel’s Wedding fame directed this comedy hit that borders on slapstick. Dermot Mulroney plays the straight man while Cameron Diaz gives one of the finest performances of her career as the sweet and perfect bride to be. With Julia Robert’s deft handling of pratfalls and an airtight script, this romantic comedy upends the genre. She doesn’t get the fairytale ending. This was cutting-edge in 1997 when the girl always got the guy. In My Best Friend’s Wedding, the only guy that Julia gets is gay, in a career-making performance by Rupert Everett. Rachel Griffiths makes a rare comedic cameo as the bride’s cousin in a early role in a Hollywood studio film. Helen Fielding’s novel gets the big screen treatment with Renee Zellweger, Colin Firth, and Hugh Grant and becomes one of the best romantic comedies of all times. Based on the bestseller of the same name, the story follows a British woman who keeps a journal of her love life, and lack thereof, over the course of a year. It’s no secret that Zellweger is as versatile as she is talented, and this is a role she was born to play. Grant and Firth are perfectly cast as her big screen love interest. The clever adaptation of Jane Austen’s Pride and Prejudice, so we already knew that the literary ambition was high. The dialogue is particularly clutch in this film. Something about pleasing both British and American audiences made the screenwriters work overtime. Helen Fielding co-adapted her own book for this comedic gem. Indeed, this film could have been placed with English comedy movies, or even, as a stretch, with American comedy movies. But we’ve put it here with the best RomComs, where it truly belongs. But as one of the top comedy movies, Bridget Jones’ Diary could be pretty much anywhere on this list and we’d still applaud its brilliance. How do we determine what’s “popular?” It’s a mix of considerations. The highest-grossing comedy movies, a pinch of cultural high-standing, a gut feeling of what kind of laughs garner mass-appeal — it’s an art as much as it’s a science. And so we present our list of the most popular funny movies ever. The premise is fairly simple, an ordinary insurance salesman one day realizes his life is actually a TV show. Simple and direct premise? Check. Over the top performance by a comedy legend? Check and check. One of the best comedies on Netflix? Absolutely! Jim Carrey is a wonder to behold in this movie and it ranks as one of his best. Laura Linney, dimples and all, is almost sinister in this deeper-than-you-think comedy. Another comedy with a similar premise, EdTV, came out a year later and tanked. And this is a testament to the strong performances and sharp actor-centric direction in The Truman Show. Matthew McConaughey in EdTV doesn’t hold a comedic candle to Carrey, whose performance is childlike and hyper-energetic. Ed Harris is superb as the god-like, executive producer Christof. Just look at Harris playing Flight Director Gene Kranz in Mission Control in Apollo 13 and then watch him in this comedy. Whether he’s pushing the boundaries of space exploration or pushing the boundaries of privacy and good taste on reality TV, Harris exudes control. You will laugh throughout the movie until the very end when Truman’s world becomes his own. By the way, this is the second collaboration between Peter Weir and Andrew Niccol. The first was the decidedly unfunny sci-fi pic Gattaca. Bad Santa is one Christmas movie you should not see with your family. But they will hear you laughing up a storm in this raunchy, R-rated comedy starring a superb Billy Bob Thornton. Let us be clear, Billy Bob Thornton was born to play this role. He plays a conman who, with his pint-sized partner, takes a job as Santa and his elf in order to rob a department store. We would have never thought of him as a funny actor (see his cameo in Love, Actually ) and he doesn’t play for laughs here. What he does is carefully play the part of the most un-Santa a person could ever be. This film spawned a sequel, which was not as well-received, to put it mildly. Kid: I wished for a purple elephant, but now I want a pink elephant! Willie: Well, wish in one hand, s**t in the other; see which one fills up first. Thornton’s perfect performance and the potty-mouthed dialogue is a winning combination that makes this film one of the best comedies of all time. Everyone knows Ben Stiller is funny. Zoolander, Tropic Thunder and There’s Something About Mary are all testament to his comedic talent. But, nobody knew Robert De Niro was funny until Meet The Parents. The King of Comedy? Not so much. Stiller and De Niro two play off each other like old pros and there is a reason they went on to make a genuinely funny sequel. It's the story of a young man who goes to meet the parents of his girlfriend before proposing to her. He encounters strong resistance from her father. The comedic value of timing is underrated, but here De Niro gives a masterclass in the timing of the straight man. With his tongue firmly in cheek, De Niro plays to type as a hard-nosed former CIA agent looking for any cracks in his future son in laws everyman veneer. And the writing in this script is on point! Jack Byrnes: "My Mother", by Jack Byrnes. You gave me life / You gave me milk / You gave me courage / Your name was Angela / The angel from Heaven / But you were also an angel of God / And He needed you, too / Selfishly I tried to keep you here / While the cancer ate away your organs, / Like an unstoppable rebel force / But I couldn't save you / and I shall see your face nevermore, nevermore, nevermore / Until we meet in heaven. Pam Byrnes: Dad, that's beautiful. Dina Byrnes: It always gets me. Greg Focker: That's amazing, so much love, and also so much information. Blythe Danner proves she’s more than Gwyneth Paltrow’s mom in the movie and Owen Wilson gives his best performance. One of the best comedy movies of all time, and one of the most popular. Equal parts schadenfreude and rooting for the underdog make this one of the most popular comedy movies ever. That, and it’s absolutely uproarious. One of the best comedy movies, period. Just when you think it’s dumb, it gets even dumber … and you can’t resist cracking up. The circle completes — Dumb and Dumber is so lowbrow that it loops all the way around and winds up being highbrow, in its own uncanny way. The behind-the-scenes story of the movie provides key takeaways on filmmaking truths boast technical- and business-related. The Farrelly brothers, Bobby and Peter, had been writing screenplays together for almost a decade, to no avail. Their eagerness and passion for Dumb and Dumber won over execs at then-independent production company New Line Cinema. Not only would the film get made, but Peter would direct — despite his having next to zero directing experience. The Dumb and Dumber shoot would prove to be his trial by fire as a director. No doubt Peter read a few filmmaking books to prepare, but the move was just as unusual in the early 90s as it would be today. An all-out gamble on fresh comedic material and the minds who came up with it. In the early 90s, the “independent spirit” blew strong through Hollywood — even when it came to comedy films. The success of the movie serves as testament to passion and confidence as the surest means to developing technical skills. Peter may not have known how to direct a movie, but he loved the material, he knew what was funny, and he winged it. And the end result? One of the top comedy movies of all time. Innate cinematic precision — evident in shot composition (see the road trip scene above) — overpowers the director’s lack of practical hands-on experience coming into the shoot. Also, that the director co-wrote the screenplay with his brother reinforces his attachment to the material. In its own way, Dumb and Dumber is an auteur film. The two lovable imbeciles at the center of the story would go on to star in two sequels and even a short-lived animated series. This is one of the funniest movies of all time because it gave Steve Carell the chance to show his comedic chops on the big screen. Also, Seth Rogen and Paul Rudd give career-best performances. This film deserves a spot here as it gave the world Steve Carell on the big screen and shows how much he deserves to be on the list of comedy greats. Bill Murray truly deserves a category all to himself so if you are looking for the funniest movie of all time, the funniest romantic comedy or a comedy on Netflix, Bill Murray will fill one or all of these categories. Yes, he already appears on our list of top comedy movies above, in Ghostbusters and Tootsie — but as the hilarious movies below prove, there’s plenty of Bill to go around. This is, hands down, one of the best comedies of all time. It is hands down one of the best romantic comedies of all time — but it’s not in our RomCom section, because, hey, groundhogs. It is one of the reasons Bill Murray is a national treasure. He plays a self-absorbed and bitter anchorman who covers his least favorite story, over and over again, as he is forced to relive the same day. Only love will bring his time loop to an end. Murray’s gives a signature deadpan performance. The daily dialogue changes even though the setting doesn’t. The situation borders on fantasy. Groundhog Day is the perfect comedy for any writer looking to see how the balance of these three elements works to make a great comedy. Screenwriter Danny Rubin even wrote a terrific book on the craft, How to Write Groundhog Day, that’s worth your time. It is truly difficult to rank all of Bill Murray’s great performance. Any of these films could be on this list by the strength of Murray’s performance. But one is a combination of situation, dialogue, and performance. The remise is: A mild-mannered therapist goes insane after one of his patient tags along on a family vacation. It’s all about baby steps in What About Bob? Richard Dreyfuss gets to ham it up to hilarious results while Murray never breaks a sweat. Another Murray good one! While Murray is not technically the star of this comedy, he does indeed steal the show. 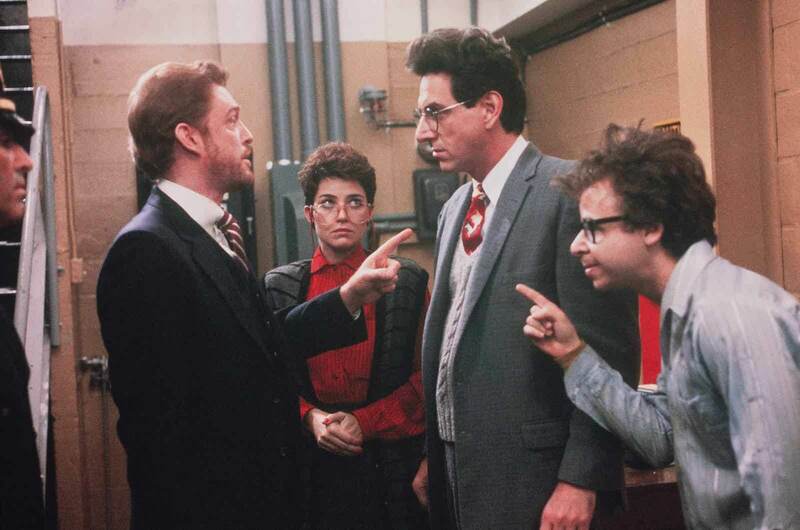 Harold Ramis directed this comedy and it was the beginning of a beautiful partnership that would see other films that rank as the best comedies of all time. The situation is simple, a posh golf course deals with a garish new member and a destructive gopher. Murray could have played any number of roles in this film, but really steals the movie as the groundskeeper hunting the taunting gopher. Chevy Chase stars in the movie as well but pales in comparison to Murray. Great movies don’t need live action or long running times to be entertaining. All over the world, filmmakers are challenging how to deliver humor. Pixar, for instance, brings humor and heart together in a few minutes. Learn how in our next post.